I show business owners how to grow their business with ease so they can focus on being the expert to their client’s expert instead of the “always hustling salesperson” stressed about where the next round of clients is coming from. I’m Stacey Brown Randall - and I’m obsessed with referrals. I went from a business failure...yes the financially, mentally and emotionally draining kind of business failure to a huge business success. All because I figured out how to generate new clients through referrals BUT I did it without asking for those referrals. I cracked the code to overcoming the decades old advice that says to receive referrals you must ask for them. People come to me because they started a business because they are an expert, they are needed by their clients and they want to be a business owner instead of being an employee, someone’s cog in a wheel. But they quickly realized to be the expert helping their clients, they have to have clients. And the one business development or sales tactic that doesn’t feel like sales is referrals, unless you are asking for them. So for that expert turned business owner, I show them how to build a business by referrals that they don’t ask for which allows them to be more comfortable and authentic in running their business. You want to save time by not networking, prospecting or cold calling all the time? Welcome! I am not Wonder Woman, but unleashing my referral explosion more than 5 years ago dramatically changed my world and the worlds of hundreds of my students. To be honest...that does make me feel a little like Wonder Woman! If you’re a business owner or professional that has to create relationships with your potential clients before they will agree to work with you and you believe those relationships, can produce referrals you’re in the right place. If you’re in a saturated marketplace (sometimes called “dime a dozen” professions) where there are a lot of people who do what you do – like financial advisors, realtors, business and life coaches, CPAs, consultants, attorneys, bankers, interior designers, photographers, home builders (and so many more) – and you want an easy yet effective way to stand out and make generating clients easier…you’re also in the right place. If you are interested in growing and sustaining your business through referrals but don’t want to have to ask, manipulate or be inauthentic in the process…then you are definitely in the right place. Yes, I have a philosophy on the best way to generate referrals. I know there are many ways to generate referrals but I believe my way is the best way. Let me tell you why. Every expert or guru out there teaches what they know, supposedly (wink, wink). They form a philosophy that is at the center of what they believe and then teach. And their philosophy informs the strategies and processes they teach you. From those strategies and processes come the tactics and tools they believe you need to use to be successful. So, when you make a decision to listen to an expert or guru make sure you understand their philosophy first. It allows you to be a better consumer of their message, marketing and ultimately their materials and products. So, to fully understand what I am all about it is important you understand my philosophy. Then you decide if it works for you. Referrals only come from relationships. And connections are built through ongoing touch points. Keeping reading as I’ll tell you how I came to form my philosophy and the results it has generated. I believe referrals are the least understood, least utilized and hands down the BEST tactic in our Sales & Marketing/Business Development toolbox. I believe the ability to generate referrals is a skill you NEED to master…and totally can…all while respecting your comfort zone. I’m a contrarian to the decades of advice out there on generating referrals and I know it. I also have results on my side so I know you don’t have to follow the conventional advice just because it’s all that has been available for the last 30 years or so. Most advice given on generating referrals is to receive referrals you have to ask. To receive referrals, you need a gazillion touchpoints mailed and emailed every month or week. And to receive referrals you have to know how to manipulate the situation. In my opinion these are all wrong. Dead wrong. And it is this type of advice that leads people to write off referrals as a practical strategy to use to grow their client base. I know there are plenty of businesses out there doing just fine without generating referrals in their business. All I can offer you is this: by building a plan to generate referrals in my business and those of my clients, we are able to save time, bring on better clients and make more money. We know that by following the plan – the system – we can count on referrals consistently and continuously (and not feel uncomfortable). The cool thing is, you don’t need to spend much money (or time) in order to attain success. You just need to have an understanding of WHAT to do (the HOW) and a shoestring budget. In 2007 I decided to take the entrepreneurial leap and left my safe W-2 job to join a small company where I would come in as a partner and run and manage a new division completely in line with my expertise. (I was 4 weeks pregnant at the time and didn’t know it – not the best timing – just sayin’). A year later, with a 4-month-old, I had a client encourage me to leave that small firm and start my own company. They would become my first and biggest client for two years. Until they weren’t and then I had to quickly start bringing on new clients to survive. It didn’t end well and I wish I could blame the recession. But that wouldn’t be true. During months and months of reflection and talking to other successful business owners I discovered where it all went wrong. One main point of contention was not establishing a system to bring in new clients in a way that worked for me. What I needed – but didn’t have – was a way to generate referrals. While working at the “corporate” job after the business failed I researched referrals. But I didn’t like what I found. It didn’t fit me, my values and it left me feeling inauthentic. So, I set out to crack the code on generating referrals WITHOUT asking and crack it I did. Once I left the job and started my next entrepreneurial adventure I applied my referral strategy and had crazy success. I have been able to generate triple digit referrals (more than 100) year over year. In my first year alone as a business coach I generated 112 referrals that I did not ask for. When demand for my coaching services went up, supply went down and my clients noticed. It was harder to get on my schedule and they wanted to know why. So, I started teaching them my referral plan and they started having the same success as well. In some cases, better success than me. While I love my work and all I get to do to help my online students and VIP Clients, there is more to me than just my obsession with referrals. Here are 5 more “personal” facts about me. I am a Red Sox loving Southern girl from South Carolina and proudly call Charlotte, NC home. I am a wife to one and mother to three. Two of our kids – our big-hearted, silly son and our brave, confident daughter - are biological. A few years ago we “acquired” our third as we took custody of our story-telling, joke-cracking nephew. I went to college to be the next Katie Couric as I majored in Broadcast Journalism. I mean, somebody had to replace her, might as well be me (ummm, well, no). Becoming an entrepreneur wasn’t a crazy stretch for me. In fact, my family is crawling with entrepreneurs but the crazy kind. Yes, I think you are crazy to own a restaurant but I can say that because I know firsthand…I’m the granddaughter, daughter, sister, wife and niece of crazy restaurant owners. But there is one big difference that separate me from them. And that’s my business failure. The Randalls are a house divided! 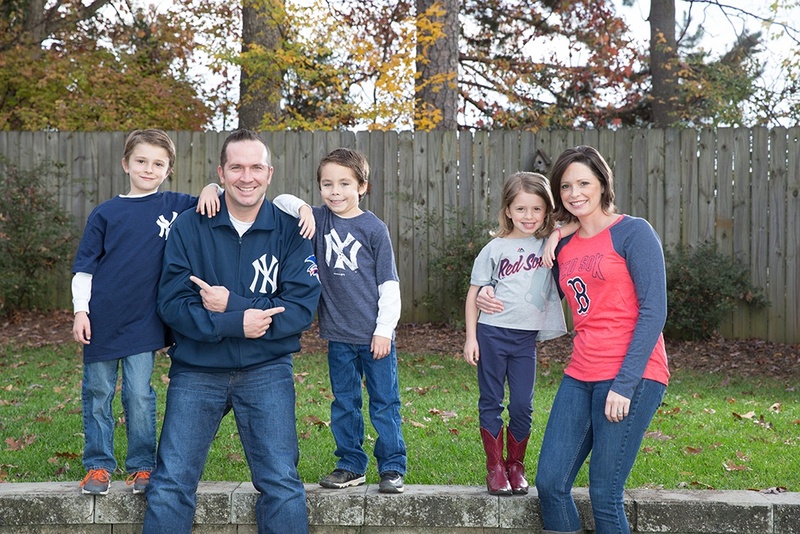 Yes, this Red Sox loving Southern girl married a die-hard from New York, Yankee fan. I love working with business owners how provide valuable service to their clients. Because business owners who care are uniquely positioned to receive referrals. You just need to know what to do, how to do it, and what to say while doing it. Here are some resources to help you. Love referrals? Hate asking? You belong here.